I Just Got GREAT News From The Cubs! Posted on October 22, 2011 October 21, 2011 by Mark E.
Just when I thought I’d gotten over the whole not being hired as Cubs GM thing, I got a great piece of news from the Chicago Cubs. Now only 21057 people are ahead of me on the waiting list to buy highly overpriced Cubs Season Tickets! I think I moved up about 5000 from last year, so I may get the Season Tickets at Wrigley Fieldright about the time I’m too old to be able to go to games. Or dead.Life is a cabaret…. Thank you for your support and your patience as a member of the Chicago Cubs Season Ticket Waiting List. 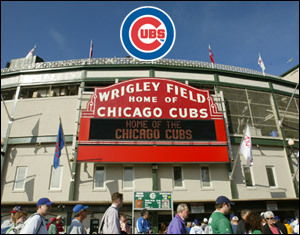 With the conclusion of the 2011 season, we’ve updated your Chicago Cubs Season Ticket Waiting List number to 21058. While you have moved up the list, we do not anticipate at this time that we will be able to offer you season tickets for the 2012 season. We will go on sale with our flex plan in January of 2012 and, as a member of the Chicago Cubs Season Ticket Holder Waiting List, we will give you early access to purchase this plan before it goes on sale to the public. This will be your best chance to secure some of the biggest games of the 2012 season. Thank you again for your support and patience as a member of the Chicago Cubs Season Ticket Waiting List. If you have questions, please contact the Chicago Cubs Season Ticket Sales Staff at 773-404-4080 or email us at cubswaitinglist@cubs.com. Hey Theo, It’s MY Turn To Manage The Cubs!